The London Basin has a bed of London Clay 60‑115 metres thick with on top, some patches of gravel. In our area there are beds of Taplow gravel about 16m above sea level and, over towards Highbury, Caledonian Rd and Camden Town, a ridge of Boyn Hill Gravel, about 33‑40 metres above. These gravel terraces were laid down as river beds and later, when the river moved away, they were left high and dry. Brickearth was laid down at about the same time as the Taplow Terraces. It is rather like the Loess of the continent, a fine‑grained, wind‑blown dust. When the North Sea and Northern Britain were frozen, the Continent was an area of permafrost which melted slightly in the summers. The Arctic was an area of high pressure and the Continent, of low pressure. This produced cyclonic winds, giving an almost permanent eastern wind over England. In the summers the top few centimetres of the permafrost melted into a fine dust which was carried by the wind to be deposited over large areas of South Middlesex and South West Essex. Brickearth was valuable for making bricks and roof tiles, and for market gardening. As a result, some deposits of brickearth have been completely worked out. Brick earth produced the fine red bricks for the Queen Anne houses built after the Great Fire in 1666. The bricks for the early houses in Stoke Newington Church St were made from Brickearth but the yellow stock bricks for the houses in Clissold Rd, were made in the Thames Valley and contain Chalk. 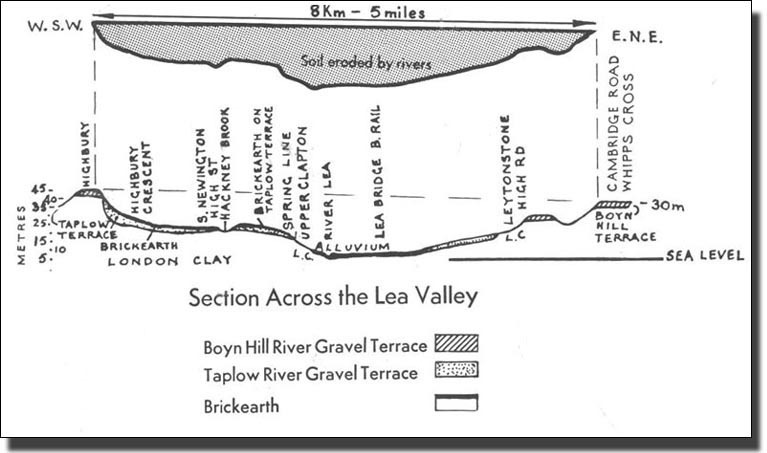 The section across the Lea Valley shows the Boyn Hill gravel at Highbury, in Leyton, and at the Cambridge Road. The Taplow Terrace Gravels have been cut away by the Hackney Brook and the River Lea. The Lea has filled its flood plain with Alluvium (the Hackney Marshes). Highbury and the Cambridge Road are , about 30 metres above the sea level, while the River Lea is barely above sea level. Think of the amount of soil the River Lea and the Hackney Brook have swept away into the North Sea to help form the Dogger Banks.